A Review Over the years we have published many feature articles that reviewed the latest designs and developments of diesel engines per se. For the review that follows, we decided to report on the many kinds of ancillary equipment and services that transform the diesel prime movers into total marine propulsion systems. We asked many manufacturers both in the U.S. and abroad to tell us about their latest diesel-related equipment. This roundup is based upon the replies that we had received by press time. For additional information on the products of any of the companies included in this article, circle the appropriate number on the Reader Service Card in the back of this issue. ALCO Alco Power Inc. of Auburn, N.Y., is currently involved in a project that will add increased fuel efficiency to its model 251 diesel engine, as well as decrease the amount of time required to achieve rated horsepower and speed from engine idle speed. This is accomplished by the application of the model 131 turbocharger on the Alco 16-cylinder 251 CE diesel engine. This is now being tested in towboat service on the Lower Mississippi. Alco is also involved with the development of a new piston design to further increase fuel efficiency over its current valve-pocketed design. Other developments on the horizon include continued experimentation with heavy fuels, camshaft design changes, and work with turbocharger application, all of which will add up to increased fuel efficiency. Circle 61 on Reader Service Card ALFA-LAVAL Alfa-Laval, Inc. of Fort Lee, N.-J., has available a new 16-page color brochure describing its activities and the kinds of technologies in which it is involved. These include centrifugal separation, energy management, process systems, and biotechnology. The new brochure, "Serving America with Technology for a Changing World," gives a detailed description of products and systems manufactured by Alfa-Laval's two major units in the U.S., the Industrial Group based in Fort Lee and the Agri Group in Kansas City. Alfa-Laval, Inc. is the U.S. subsidiary of the international Alfa- Laval Group headquartered in Sweden, a world leader in process systems and equipment for a broad range of marine, industrial, and other applications. Circle 2 on Reader Service Card ALPHA DIESEL Within the M.A.N.-B&W organization, Alpha Diesel in Frederikshavn, Denmark, is the specialist in complete marine propulsion systems. In one of the most modern factories of its kind, Alpha Diesel's more than 80 years of experience is coordinated and translated under one roof into high-quality diesel engines, gearboxes, propeller equipment, and remote controls. The complete propulsion system is covered by a single warranty and supported by a worldwide service organization, with spare parts stocked at all important locations. The Alpha system primarily consists of a modern M.A.N.-B&W four-stroke, medium-speed diesel engine designed for efficient operation on heavy fuel; an Alpha gearbox designed for heavy-duty operation; an Alpha controllable-pitch propeller of rugged design; and an Alpha electronic remote control system to obtain the best possible fuel economy. The power range of the Alpha diesel is 680-5,400 bhp per engine and multiples thereof. Circle 62 on Reader Service Card AMERICAN METAL BEARING American Metal Bearing Company of Garden Grove, Calif., has just published a new full-color brochure, "Excellence in Bearing Design and Manufacture." The eight-page publication outlines the product lines, design and manufacturing methods, experience, and client list of the company. AMB has been manufacturing and maintaining large bearings for ship propulsion systems since 1921. The company now offers a comprehensive service to shipbuilders, shipowners, and navies, designing, manufacturing, and maintaining complete, fully integrated propeller shaft bearing systems. Circle 63 on Reader Service Card AMERICAN-STANDARD The Heat Transfer Divison of American-Standard Inc., Buffalo, N.Y., has published a new bulletin giving details of small, pre-engineered, fixed-tube-sheet heat exchangers used for heaters or oil coolers in a wide variety of industrial applications. The brochure includes data on the 57 BCF® model heat exchangers, many of which are available from local American-Standard distributor stock. Also included is information about HCF® models, which can be quickly assembled using standard, pre-engineered components to accommodate special shell and tube materials, special tube sizes, nozzle configurations and orientations, special gaskets, and mountings. Model HFF units, also included in the new bulletin, feature SAEflanged, shell-side connections for quick bolt-in-place installation. Circle 3 on Reader Service Card ARMCO "How Armco Now Provides You Bigger and Better Aquamet Boat Shafting" is the title of a new brochure published by Armco's Specialty Steels Division headquartered in Butler, Pa.
To make its Aquamet shafting even more appealing to naval architects and boatbuilders, Armco provides shafts with four different combinations of properties , each offering special advantages in either properties or price. Aquamet 17, 18, 19, and 22 shafting have varying degrees of strength, toughness, corrosion resistance, and cost to meet customers' specific requirements for a variety of applications, from use on tugs, patrol boats, commercial vessels, and pleasure craft. Current mill modernization combined with free design assistance and ready product availability make Armco a leading choice for boat shafting, and new Armco facilities and equipment provide new sizes and better quality and precision. Circle 64 on Reader Service Card AMERICAN UNITED MARINE American United Marine Corporation, headquartered in Saugus, Mass., is the exclusive U.S. representative for A/S Maritek of Bergen Norway, a consulting engineering firm that has developed performance monitoring systems for diesel engines. These include the Maritek torque thrust meter, waste heat program, combustion analyzer program, scavenging air program, and performance program. The Maritek Combustion Analyzer (MCA) is a computer-based diesel engine analyses program using fuel injection, cylinder pressure, scavenging air pressure, and crank angle indicator. The MCA output provides: graphical and numerical presentation of cylinder pressure and fuel injection pressure; mean indicated pressure and indicated horsepower; ignition timing/ignition lag; and bar graph of MEP cylinder comparison. Additional data of compression pressure, maximum cylinder pressure, expansion pressure, ignition, and injection timing are compared with reference curves. MCA programs are available for slow- and medium-speed diesel engines for both newbuilding and retrofit vessels. The additional Maritek programs of waste heat scavenging air deal with energy balance and recovery. Circle 18 on Reader Service Card BFGOODRICH/MOFFITT The product of years of research and development by BFGoodrich and Lucian Q. Moffitt, Inc. of Akron, Ohio, Cutless® brand bearings have an outstanding reputation for high-quality and long-lasting performance. A tough, resilient rubber lining and exclusive water wedge design are the two distinguishing characteristics largely responsible for Cutless bearings' 60-year history of success in marine applications. BFGoodrich's basis for using rubber as opposed to traditional hardsurfaced material is its low friction coefficient when wet. Resistant to oil, grease, and most chemical solutions, rubber bearings last many times longer than hard-surfaced bearings in the most severe abrasive conditions. Adding to the Cutless bearing's long life is its exclusive water wedge design that incorporates rubber grooves that easily channel the flow of water. As the shaft rotates, dirt and grit roll into the grooves and flush away, maximizing lubrication and minimizing damage to the bearing and shaft. Cutless bearings are designed with either metal or non-metallic shells. Those with metal backing come in either a full-molded style of solid or split design, as well as in a segmental style. The Cutless FE (fiberglass epoxy) bearing is also available. Circle 65 on Reader Service Card CATERPILLAR Off-the-shelf availability and low exchange price are key benefits of Caterpillar Tractor Company's factory- remanufactured turbochargers. Now available for 3208, 3306, 3406, and 3408 engines, these turbochargers offer minimum downtime at prices as low as 25 percent of the new turbocharger price. Cat's remanufactured turbochargers incorporate the latest design advances for longer life, better performance, and improved fuel economy. The company backs them with the same national warranty as new turbochargers—six months, unlimited mileage/hours—honored by more than 2,500 engine parts and service locations in North America (some 3,500 worldwide). Circle 66 on Reader Service Card CINCINNATI GEAR (CGCO) The Cincinnati Gear Company in Ohio has recently made significant advancements in the design and manufacture of large carburized, hardened, and precision-ground (CHG) gears that will be of special interest to naval architects, marine engineers, and shipbuilders. In a technically unprecedented move, CGCO has produced CHG gears with a diameter well over 100 inches (9 feet) for use in a new class of T-AO fleet oilers developed by the U.S. Navy and being constructed by Avondale Shipyards. The T-AO is powered by two 16,500-bhp diesel engines, each coupled to a CGCO gearbox. This machining milestone has established Cincinnati Gear as the primary source for all CHG gears over this diameter. These large gears can be produced to meet AGMA Class 15 level quality requirements, while some of the elements may exceed AGMA 15 levels. Propulsion systems making use of the higher level AGMA quality gears operate with much lower noise and vibration levels than conventional gearboxes. Moreover, audible noise signatures sent out by noisy drive trains are greatly reduced, allowing warships to move closer to their targets without being detected. And because the gears have been made to a specified blueprint value, mating is not required when retrofitting; an individual gear can be replaced instead of the entire gearbox. In drive systems using CHG gears, the gear tooth surfaces generally have a Rockwell C hardness value of 60. As a result, gears are designed with a high power density allowing the manufacture of large marine drives being at least 20 percent smaller and lighter than conventional through-hardened designs developed during World War II. To accomplish the grinding of large precision gears, CGCO has installed the largest ultra-precision grinder in the U.S. It is equipped with in-cycle inspection equipment for measuring tooth spacing and for checking involute and lead. CGCO gears are designed with built-in performance modifications that insures full-face contact during full load. The inspection equipment computer prints out the exact AGMA quality level achieved and eliminates the need for operator interpretation of blips traced on a strip chart. By the time the gears are taken from the machine, their quality level has been checked, established, and recorded several times. Cincinnati Gear Company has been a leader in CHG gearing since 1936, and this long learning curve is the key to making large CHG gears an affordable alternative for future marine drives. By applying CGCO's latest state-of-the-art technology and equipment, gears of lower than Class 15 quality can be produced with new-found economies. Circle 67 on Reader Service Card CUMMINS Premium Blue, a new premium grade 15W-40 diesel engine lube oil from Cummins Engine Company of Columbus, Ind., is now available in the Southeastern states in a test marketing plant that will result in national distribution of the oil by mid-1985. The test marketing is Cummins's first major step in a program to provide operators of diesel engines with a lube oil designed specifically to maximize performance of their engines. The project has resulted in the development of a combination of oil base stock, viscosity improvers, detergents, and stabilizing additives to create a premium multigrade oil. Premium Blue is specially blended to provide cold start protection in temperatures as low as minus 13 F. Laboratory tests have shown less oil consumption until overhaul of an engine, and up to 30 percent more miles between overhauls as a result of improved lubrication and superior protection against oxidation and wear. Circle 4 on Reader Service Card DANA CORPORATION A new four-page brochure describing the Wichita® mechanical power takeoff (PTO) that transmits and disconnects power from heavyduty diesel engines is now available from the Power Transmission Division of Dana Corporation, Toledo, Ohio. Highlighted in the brochure are the Wichita PTO's design advantages, including its incorporation of the heavy-duty Spicer® Angle- Spring® clutch for automatic selfadjustment and constant plate load throughout the wear life of the unit. The brochure also describes typical PTO applications, and gives detailed instructions for PTO selection. Included for quick reference are PTO selection charts for the major makes of diesel engines. Complete engineering and dimensional information for the PTO are provided in line drawings accompanied by tables. Also included are toll-free numbers of regional sales offices where additional technical information may be obtained. Circle 68 on Reader Service Card ELECTRO-MOTIVE DIVISION A General Motors Electro-Motive Division production marine drilling power unit, incorporating the EMD 20F9B 20-cylinder engine, has successfully completed the Det norske Veritas 15-degree permanent inclination test. The DnV approval applies to EMD's complete line of naturally aspirated and turbocharged engines, as applied to the drilling power unit configuration. The test, which consisted of 12 hours of running time at full rated horsepower and speed, was witnessed by officials from DnV. the American Bureau of Shipping, and Lloyd's Register of Shipping. The test is mandatory for generating sets used on offshore rigs and platforms requiring DnV certification. The means to achieve the 15- degree inclination requirement were based on a "total system" design approach. Engine, generator, modular accessory rack, and external lube oil tank were mounted on a common base and interfaced, as necessary, to provide a power unit capable of full rated output. Lube oil and cooling water pressures and temperatures remained constant during the test. Normal engine start was achieved prior to initiation of each 6-hour test, and clear exhaust gases were observed throughout the entire load testing. Circle 5 on Reader Service Card ELLIOTT COMPANY The Elliott White Gill Thruster and propulsion unit is a low-head, high-volume axial pump capable of delivering thrusts of up to 38,000 pounds in every direction—through a full 360 degrees. It mounts flush with the hull, below the vessel's draft line, open to the water at both suction and discharge ports. Units are fitted in the bow section and/or the stern, depending on application. Thrust is produced by drawing water through the intake, and discharging it on an almost horizontal plane through a deflector that rotates a full 360 degrees. No part of the system protrudes below the vessel's keel line. The Elliott White Gill unit, in horizontal, vertical, "T3", and cross shaft designs, gives ships of evenclass precision maneuverability in hundreds of applications offshore and on inland waterways around the world. Drivers for thrusters can be diesel engines, ac or dc motors, or hydraulic motors. The diesel engine is an ideal driver because it is variablespeed. and requires no support system to furnish its power. As a result, diesel engines are the selected driver for a large percentage of Ellott's thruster applications. When Elliott Company decided to package its cross shaft model with a driver, the diesel engine was the obvious choice. By mounting an engine bracket on the thruster. the engine could be mounted piggyback fashion, with its drive shaft parallel to the input shaft of the thruster. Selection of appropriate sheaves accomplishes the desired speed match, and varying the engine speed permits throttling of the thruster. Because the White Gill performance follows a typical pump curve, the speed varies much less than the horsepower and thrust as the engine is throttled. For instance, if 50 percent of the thrust is required, the horsepower requirement is only 35 percent and the speed drops by only 29 percent. A variety of engines are used, depending on customer preference. Circle 69 on Reader Service Card FAIRBANKS MORSE Colt Industries' Fairbanks Morse Engine Division in Beloit, Wise., continues to be the leading manufacturer of medium-speed, highhorsepower diesel engines in the U.S. With a range of 640 to 29,286 bhp and the ability to burn a wide variety of fuels, these engines are widely accepted in both the marine propulsion and stationary power marketplaces. Fairbanks Morse has strengthened its entire parts and service operation to improve all aspects of customer service worldwide. All Parts and Service Centers are computer- integrated with the main plant in Beloit to quickly process orders for stock items or special made-to-order parts. Capabilities of these service centers include engine rebuilding and individual component repair. Complete fuel injection service available at the Reno, Nev., facility allows FM to stock rebuilt and exchange assemblies in all locations to complement its parts inventories. With diesel engines available for instructional use, FM's Diesel Training Center provides customer personnel with hands-on service training on opposed-piston and Pielstick engines. Training specialists guide students to better understand and perform necessary steps for proper engine maintenance. Fairbanks Morse's Electrical Engineering Department offers control and systems design capabilities for engine gauge and alarm panels, bearing temperature monitoring systems, and engine-generator control panels. Panels and systems assembled and tested by skilled craftsmen provide trouble-free control of engine operation. Circle 70 on Reader Service Card FALK The Falk Corporation of Milwaukee, and Zahnraderfabrik Renk AG of Augsburg, West Germany, recently signed a license agreement under which Falk will have exclusive manufacturing, sales, and distribution rights in the U.S. for the Renk Series AWS reverse/reduction drives. In addition, the two companies have agreed to cooperate on custom design marine propulsion drives, primarily for Naval applications in the U.S.
For many years, both Renk and Falk have demonstrated design, manufacturing, and application excellence in marine main propulsion gear drives. The combined strengths of the two companies will enhance the products offered to the marine industry, both in standard and custom design drives. The Falk Corporation, a subsidiary of Sundstrand Corporation, is a leading producer of gear drives and flexible couplings. Renk is a subsidiary of GHH, one of the largest engineering groups in Europe, and is well known worldwide for the special- purpose marine propulsion gears. Circle 71 on Reader Service Card GENERAL THERMODYNAMICS General Thermodynamics Corporation of Plymouth, Mass., has just published a technical bulletin on its model 300-A BMEP balancer that is used to equalize the cylinder load of any multi-cylinder internal combustion engine equipped with individual fuel adjustments. The balancer is described as being designed to fit the standard indicator valve. It is quickly connected and sealed with slightly more than hand-tight torque. When the indicator valve is opened, the pressure guage will come to a reading. The pointer is steady and will stay fixed as long as the cylinder load is not changed. Keeping the engine load constant, readings are taken for each cylinder, then fuel adjustments are made either up or down until all cylinders yield the same pressure reading. Each cylinder is then delivering equal power. Along with the application, the construction and operation of the balancer are described, and some of its characteristics are listed, such as steady, accurate, repeatable, reliable, requires no maintenance, fits standard indicator valve, and easy to use. Circle 72 on Reader Service Card FERROUS Ferrous Corporation of Bellevue, Wash., has developed a complete system for administering catalyst into the fuel oil of a diesel engine. The Ferrous Marine System (FMS) consists of a proportioning pump, depulsing unit, and 24-gallon day tank for injecting Ferrous FE-4 catalyst into the fuel oil at a ratio of one gallon per 3,000 gallons of fuel. The FMS is said to mix the fuel and catalyst with a minimum of effort and maintenance, and a high degree of reliability. The standard package also includes a 90-gallon storage tank. The proportioning pump allows accurate injection of the FE-4 catalyst from the day tank into the fuel line. It is powered by a variablestroke, oil-driven diaphragm pump that operates on 115-volt ac. On special order it is available with dc and multiphase pump motors. The pump comes in various output capacities, measured in gallons per minute or hour, to meet virtually any fuel flow requirement. Circle 6 on Reader Service Card GEMS SENSORS Gems Sensors Division of Plainville, Conn., has introduced a companion digital indicator for use with its Flow Ranger flowmeter. The indicator provides a readout of flow rates of 0-36 gallons per hour and 0-360 gph, as well as cumulative consumption rates. The positive-displacement Gems flowmeter measures these flow rates, and the indicators provide an accuracy within two percent of actual flow rate. The indicator case is made of durable steel, and measures 3% by 6'/s inches. Used with Gems flowmeters they provide total system control and insure uninterrupted flow of liquid to its point of use. Circle 7 on Reader Service Card GEORGE ENGINE As much as an 11.5-percent reduction in fuel consumption can be realized by George Engine Company's "bypass operation"—the upgrading of a Detroit Diesel 149 Series engine from its normally aspirated (NA) configuration to a turbocharged, intercooled, blower bypass (TIB) arrangment using the latest high-tech components from Detroit Diesel. Fuel savings provide a rapid payback of the cost of the conversion. With a smaller fuel injector, the TIB configuration produces the same horsepower at the same rpm as the NA arrangement, but does it with significantly less fuel. Alternatively, the owner may elect to use larger injectors to achieve greater horsepower output, but still at a competitively low specific fuel consumption figure. Circle 73 on Reader Service Card GOLTEN Golten Marine Company of Brooklyn, N.Y., and Golten Service Company of Miami, Fla., recently announced a new agreement with Mitsubishi Heavy Industries of Japan. The Golten companies and MHI have signed a service and spare parts agreement covering the Mitsubishi type UE engine and MET turbochargers. Golten's specially trained technicians will be on call, on short notice, to service these engines and turbochargers at any U.S. port. Under this agreement, Golten is also authorized to sell original MHI spare parts and perform "warranty" repairs and normal maintenance. Circle 8 on Reader Service Card GRANT MANUFACTURING Grant Manufacturing & Alloying, Inc. of Souderton, Pa., produces a full range of babbitt alloys for marine applications. All material is refined in accordance with specifications QQT390A and ASTM B-23. Grant's babbitt is currently used in marine bearing facilities throughout North America. The various babbitt alloys are available for immediate delivery from the plant in Souderton, as well as from distribution warehouses in San Francisco, Houston, and Chicago. Circle 74 on Reader Service Card GULF OIL Selection of appropriate lubricants for marine equipment is one of the most important steps toward insuring maximum protection of marine engines and efficient operation of vessels. To aid in the selection process, Gulf Oil Corporation has published a guide to its complete line of marine products. Titled "Gulf Inland & Coastal Marine Lubricants," the brochure includes a quick reference guide to Gulfs marine lubricants as well as detailed data sheets on the properties of individual grades of lubricants. Gulf marine products are available from many midstreamers and commercial marine outlets. A convenient pull-out folder included in the brochure identifies the ports where Gulf marine service and products are available. Circle 9 on Reader Service Card HAMWORTHY With more than 60 years of expe- rience, Hamworthy Engineering Ltd. of Poole, Dorset, England, is well known in both the U.K. and overseas. The company manufactures and supplies a comprehensive range of equipment allied to marine diesel engines. Each product is backed by an international spares and service network with a 24-hour turnaround. Hamworthy recently introduced a new diesel-engine-driven, air-cooled air compressor for marine air starting duties. Designated the 35MM Distair, the unit is a two-stage machine having a capacity of 15 cubic meters per hour and a maximum discharge pressure of 30 bar. It has a horizontal configuration, with the s i n g l e - c y l i n d e r diesel engine mounted above the compressor crankcase. The combined compact unit has a simple three-point mounting, and requires no external services apart from sufficient ventilation. The set meets the requirements of the major classification societies, as do the remainder of the Hamworthy range of compressors. With complete accessibility for servicing, these compressors are designed for all marine duties including starting air, and have capacities ranging from 83 to 735 cubic meters per hour with pressures up to 40 bar. The company's Sea Star diesel fuel blender has been in service for some time, with many well-known vessels showing substantial reductions in fuel costs. The compact unit blends relatively cheap oil used in the main engines with the more expensive generator diesel oil. The blended oil is then supplied to the generator without using additional pumps, heaters, or filters. With conventional blenders, there is a danger that the two fuels could stratify in the blended fuel service tank. The Hamworthy Dolphin Series of diesel cooling, lubricating, and fuel centrifugal pumps are designed to meet the needs of most marine applications, from the smaller single- duty pump to the large double entry and two-stage versions. Capacities range from 60-1,800 gallons per minute, 700-32,000 gpm, and 150-1,000/150-700 gpm, respectively- A range of horizontal triple-screw pumps also manufactured by Hamworthy are designed to handle lightviscosity oils, heavy fuel oils, and lubricating oils. Circle 75 on Reader Service Card HARBORMASTER Literature on its fixed-pitch tunnel thrusters is available from Harbormaster of Quincy, Mass., a Division of Mathewson Corporation. The thruster is handsomely illustrated on the cover of the publication, which also gives important data in chart form on the various Harbormaster models, along with a diagram and informative text. Circle 76 on Reader Service Card JOHNSON RUBBER The water-lubricated bearings manufactured by the Duramax Marine Division of The Johnson Rubber Company, Middlefield, Ohio, are furnished in sleeve and flanged types with naval brass shell in a full range of sizes. Sleeve bearings are also supplied with a non-metallic shell and are ideal where corrosion or electrolysis is a problem. Flanged bearings are available in solid or split style, and can be furnished for mate mounting with Duramax bronze stuffing boxes that are available in shaft diameters up to 15 inches, and in models for air/water/ grease service, air/grease, air/water, water only, and grease service only. Split styles are also available to facilitate installation and servicing in close quarters. Stuffing boxes employing air service feature the Duramax rubber "Air Seal" ring, which when inflated seals itself around the propeller shaft and seals out water while packing is being changed. Deflating allows the rubber ring to retract to its normal position from around the shaft. Duramax keel coolers for engine or auxiliary equipment cooling feature spiral tubes of 90/10 cupronickel. Single—and double-bank models, which do not require through-the-hull fittings, range from four-tube to 24-tube. Circle 77 on Reader Service Card KAMEWA for a 98 V2 -foot catamaran ferry in 1980. The high performance of the units was verified by comprehensive full-scale measurements. The tests showed that the water jet propulsion gave a fuel consumption equal to or lower than that expected for a fixed-pitch propeller installation. Today KaMeWa water jet units have been ordered for commercial passenger ferries, passenger cruising craft, motor yachts, patrol boats, crewboats, workboats, and river towboats. Delivered units are in the power range of 161 to 13,410 bhp. The commercially operated passenger ferry with the first delivery has accumulated more than 9,000 running hours, during which a high degree of reliability of the 1,560-hp water jet units has been demonstrated. In total, all units in service have accumulated about 100,000 running hours. Circle 78 on Reader Service Card KHD Klockner-Humboldt-Deutz AG (KHD) of Cologne, West Germany, recently introduced two centralized service systems for owners of Deutz marine diesel engines. Called Ship Information Service (SIS) and Ships' Information Processing System (SIPS), they are designed as a new method for lowering engine (continued on page 28) In 1937, KaMeWa of Sweden delivered its first controllable-pitch propeller; since then, the company has been involved in marine propulsion and is today the world's leading CCP manufacturer. KaMeWa propellers are produced in the U.S. by Bird-Johnson Company of Walpole, Mass. In the mid-60s, the first KaMeWa water jet unit was delivered to the Swedish Navy. This 250-hp unit was followed by a 480-hp installation in a private craft. Many potential water jet projects for all kinds of craft were investigated. It soon became clear that water jet propulsion provides some very positive characteristics, such as shallow draft and good maneuverability, but unfortunately combine with poor efficiency- Thus water jet propulsion, with the then state of the art, could only be justified on some small, specialpurpose craft, and the market was not very interesting for KaMeWa. However, it was also realized that if the performance of water jet propulsion could be improved to about the same level as that of a fixedpitch propeller, water jet units could be a very interesting product. Thus a development program with this aim was started by KaMeWa, mainly based on the model testing facilities already existing within the company. The first of these high-performance, water jet units was delivered for a 98 V2 -foot catamaran ferry in 1980. The high performance of the units was verified by comprehensive full-scale measurements. The tests showed that the water jet propulsion gave a fuel consumption equal to or lower than that expected for a fixed-pitch propeller installation. Circle 78 on Reader Service Card KHD Klockner-Humboldt-Deutz AG (KHD) of Cologne, West Germany, recently introduced two centralized service systems for owners of Deutz marine diesel engines. Called Ship Information Service (SIS) and Ships' Information Processing System (SIPS), they are designed as a new method for lowering engine operating costs, increasing operating reliability, and reducing the workload for shipboard personnel. With the SIS, the ship's engine is fitted with a number of sensors that record the characteristic engine operation data. These data are transmitted via satellite to the KHD computer center, where the computer compares the periodically transmitted operating data with the figures recorded in the test report made at the time of engine acceptance at the KHD factory, and the basic data entered during engine commissioning by the owner. The results of the individual data comparison are evaluated by skilled KHD engineers, who prepare an engine status report with trend analysis, which is sent to the shipowner together with recommendations regarding necessary maintenance work. Based on the information received, the owner will decide on the measures to be taken. The SIS system further includes an individual maintenance schedule tailored to the actual operating conditions of a particular engine installation, providing a base for long-term planning. SIS furnishes the shipowner not only with an efficient means for cost-saving planning of maintenance and service work, but also with engine records over long service periods. Circle 7 9 on Reader Service Card KORODY-COLYER Korody-Colyer Corporation of Wilmington, Calif., one of the world's largest after-market component manufacturers, produces a complete line of replacement parts for the Detroit Diesel most popular Series 53, 71, and 92 engines. All K-C parts, new and rebuilt, are said to equal or exceed OEM in every way except price, which is generally 20 percent lower on components from individual replacement to complete engine overhaul. K-C has made diesel engine injectors and other components a specialty for more than 20 years, and its entire line is backed by a comprehensive factory warranty. All new and remanufactured K-C parts, including the exclusive matched and balanced sets of injectors, are warranted equal to new. Circle 8 0 on Reader Service Card LIPS PROPELLERS For more than 50 years, marine engineers, naval architects, and vessel owners and operators around the world have been familiar with the Lips name. Lips Propellers, Inc. is headquartered in Chesapeake, Va. Since 1962, Lips has manufactured a family of controllable-pitch propellers to keep pace with the changing speed, power, and size requirements of modern vessels. Mechanically and hydrodvnamically more sophisticated than the traditional monobloc propeller, today's CPP systems are the result of Lips' vast experience, research, and development. The company has made a thorough study of the effects of seawater, ice, sand, shock, vibration, and fatigue. Lips has designed CPP systems that provide high efficiency, low maintenance, easy assembly and disassembly, and maximum reliability. The product line consists of three models—the C-type for up to 50,000 shp, the LC-type for a range of 1,200 to 7,000 shp, and the L-tvpe for 200 to 2,400 shp. To date, Lips has supplied the marine industry worldwide with CPP installations for an aggregate of more than 8,840,000 horsepower. Since 1975, the company has supplied 40 dynamically positioned drillship installations. Complementing the CPP thruster installations are Lips' ANCOS 2000 and ANCOS 4000 electronic analog control systems. The ANCOS 2000 is applied when there is one prime mover per shaft line; the 4000 system is involved with multiple prime movers per shaft line, or very high levels of vessel control automation. Lips' transverse tunnel thrusters are available in fixed—or controllable- pitch configurations. The FT Model fixed-pitch thrusters range from 100 to 2,700 horsepower; the CT controllable-pitch models range from 200 to 3,650 horsepower. The standard components of Lips thrusters, both FT and CT, include the propeller, pod with right-angle gearing, hydraulic control unit (for the CT series), the lubricating and hydralic system, remote control, and starting equipment. The tunnel is fitted with a stainless-steel liner welded in the way of the propeller to prevent local erosion of the tunnel. Tunnels are provided in standard lengths for each size thruster; other lengths can be supplied upon request. Circle 8 1 on Reader Service Card LUFKIN Founded in 1902, Lufkin Industries Inc. of Lufkin, Texas, has an established reputation for building dependable heavy machinery. The company begin building marine gears durihg World War II, and started marketing units of its own design in 1956. Since then, Lufkin has built thousands of diesel-driven marine gears with outputs ranging from 450 to 20,000 bhp. Applications include oceangoing tugs, river towboats, tug/supply vessels, tankers, Great Lakes ore carriers, harbor tugs, fishing craft, and many other vessels. While Lufkin looks on its past accomplishments with pride, it realizes that diesel power systems are changing and demands placed on the reduction gear are getting more complex. With this in mind, the Texas company is maintaining its old reliable lines of marine gears while adding new models to meet the challenges to today's marine propulsion systems. Lufkin marine gears are designed and constructed for many modes of operation. Typical propulsion systems include single engines driving either a fixed-pitch or controllablepitch propeller. Multi-engine or compound gears are available in either reverse/reduction or straight reduction designs. The company's newest designs, the H.G. Series, transmit from 700 to 1,700 bhp at speeds up to 1,900 rpm. These gears utilize case-carburized and ground gearing, plus oilcooled, air-actuated clutches. These units are designed with the same reliability as the larger Lufkin gears. Circle 82 on Reader Service Card MARINE ELECTRIC RPD Galbraith-Pilot Marine (GPM), a product line of Marine Electric RPD, Inc. of Brooklyn, N.Y., has been a leader in the field of monitoring and control systems for the marine industry for more than 20 years. Recent developments have been in the area of packaged monitoring and control systems for completely automating the engine rooms of diesel-powered vessels. GPM ship automation systems conform to the latest IEEE #45 Marine Electrical Installation Standards, American Bureau of Shipping Rules, U.S. Coast Guard Regulations, and Maritime Administration requirements in conjunction with manned and unmanned engine room operation. GPM ship automation systems are available in a variety of basic configurations that can be tailored to meet specific vessel requirements. One example of a basic configuration is a system for a vessel with two non-reversing, constantspeed engines driving two controllable- pitch propellers through separate reduction gears. Such a vessel would be certified for one-man engine room operation (ABS Notation ACC). As this system has already been designed, manufactured, and installed, the major engineering costs have been reduced, making it GPM's most cost-effective package. The major components of this system are the engineer's central control console, bridge control console, local control panels, and the engineer's accommodation alarm panel. The system can be converted to unmanned operation with a minimum of additional control instrumentation. Circle 83 on Reader Service Card MARINE MOISTURE CONTROL The lube oil clarifer and coalescer manufactured by Marine Moisture Control Company (MMC) of Inwood Inwood, N.Y., is designed to remove water, sludge, and solids from diesel fuel and lube oil systems without removing any of the additives from the oils. Except for a small electric motor driving a gear pump, all moving parts are eliminated, thereby reducing costly mechanical maintenance. This unit has no open drains and it can be run continuosly on the main turbine sump without the danger of losing oil to the bilge. A two-stage separating process is used. The contaminated emulsified oil and water mixture is pumped into the unit and through the coalescer elements, where all contamination larger than approximately three microns is removed and the emulsion is broken into droplets of water suspended in clear oil. The oil rises into the top shell where the water separator screens allow the oil to pass through while holding back the water droplets until they collect and fall to the bottom of the unit to await manual draining. These MMC units have been very successful in installations in main lube oil sumps, #2 diesel fuel separation, auxiliary generator sumps, hydraulic oil sumps, and stern tube lube oil applications. Many options and variations are available including heaters, automatic water drains, and filter element dirt indicators. Circle 84 on Reader Service Card MEGASYSTEMS The Direct Optical Tuning (DOT) combustion analysis system designed and manufactured by Megasystems, Inc. of Boca Raton, Fla., is a diagnostic tool for use on diesel ships. This system provides the operator with a simple and straightforward method of accurately tuning diesel engines to their optimum performance. No operator set-ups or calibrations are required. The DOT system measures more than one cylinder at a time, thereby cancelling out changes caused by increasing or decreasing engine rpms or the engine load. This allows the operator to accurately balance the power output of each cylinder. Use of the DOT system provides two major benefits. First, it allows operators to observe the time of ignition, expansion time, peak pressures, etc., in direct relation to the crankshaft position, decreasing fuel costs significantly. (For each 1° the crankshaft angle is off, a 2-percent fuel loss occurs.) Second, it allows operators to balance cylinder power output, reducing heat imbalance, vibration of the engine, and increasing the engine's life. The standard DOT system contains a small CRT, a processing unit, and two sensors that are attached to the engine. Information from the sensors is displayed as a waveform, which is analyzed by the operator. Circle 85 on Reader Service Card MITSUBISHI KK Mitsubishi Kakoki Kaisha, Ltd.
of Japan is offering literature on three new products that the company recently placed on the market as a solution to the fuel quality problem. The products are the Selfjector Excellent-Series (SJ-E), the e-HIDENS- System, and the Marine Decanter Centrifuge. The attractive 16-page brochure on the SJ-E explains that the new unit is a remodel of the original Selfjector (disc type centrifugal separator) that incorporates many new features such as a pilot valve mechanism in a high-tensile stainless-steel bowl, and the introduction of a microprocessor into the automatic control system. Seven models of total and partial discharge separators are available so that the most economical unit for any particular main engine can be selected. The brochure contains cutaway color views, text, and important data on the various models and the automatic control system, as well as dimensions and space for installation. The six-page brochure on the e- HIDENS-System states that the deterioration of fuel oil for diesel engines prompted the development of this high density fuel oil treatment system. The pamphlet contains an outline of what the system is, and discusses its features, actions, main components, and throughput capacity. Several pages of drawings, charts, and diagrams complement the text. The Mitsubishi Marine Decanter Centrifuge is the subject of literature that points out it was also developed to cope with the deterioration of marine fuel oils, and that it fully meets the requirements for the clarification of low grade fuel oils with high viscosity, high specific gravity, and especially high content of sludges. The brochure covers the principles and and structure of the Decanter Centrifuge, its features, the effect of two-stage purification through the combination of Marine Decanter KVZ-M and Disc Type Oil Purifier (MHI Selfjector), and specifications for the various models. Circle 10 on Reader Service Card NORCONTROL The DCS 8800 digital governing system from Norcontrol of Norway provides a complete package solution for all speed-governing tasks on low-speed, long-stroke engines. Using compressed air as a power medium, its main purpose is to regulate the position of the engine fuel servo in order to keep engine speed equal to a reference speed setting. The latter can be set from two selectable ship systems, usually the bridge or engine room, while slowdown or shutdown signals from external safety systems trigger an automatic response. Two separate and self-contained computer processing sub-systems are combined in the package—handling speed regulation and fuel actuation functions, respectively. These sub-systems employ similar hardware modules, in line with Norcontrol's general commitment to highly standardized equipment and circuit boards. All processes input and output signals are interfaced through separate plug-in adaptors, with options for all standard signal formats. The DGS 8800 adapts to both fixed and controllable-pitch propellers, and other features include fuelsaving functions such as load-limiting. Computerized signal handling of all measurements and controls is performed by the system, which offers panel push-button flexibility for selecting, adjusting, and testing performance. Circle 86 on Reader Service Card NORTH AMERICAN MARINE JET North American Marine Jet Inc.
is a production manufacturer of commercial/military water jet propulsion systems located in Benton, Ark. The Nomera drives the company produces have been designed and developed especially for diesel engines of the 1980s and beyond. Popular engines for the Nomera 14 are the Detroit Diesel 8.2-liter 53 Series, General Motors 6.2-liter, International 5.7-liter, Caterpillar 3208 Series, and Cummins' new 6- cylinder line, as well as Perkins, Mercedes, Ford, Volvo, and other diesels in the 200-300 bhp/2,600- 3,500 rpm range. After many years of successful application with the Detroit Diesel 71 Series engines, the new Nomera 20 drive has been redesigned for applications for engines such as the Detroit Diesel 92 Series, Mercedes, M.A.N., Cummins, Volvo, Deutz, and other diesels that produce from 300 to 700 bhp in the 1,800 to 2,400 rpm range. Nomera propulsion systems and thrusters are viable alternatives to conventional propeller systems, with added benefits such as shallow water capability, lower operating costs, reduced downtime, simplicity, and comparable original costs. Circle 87 on Reader Service Card OMNITHRUSTER When Imperial Oil Ltd. needed a rapidly responding bow thruster to work in ice and rough water they chose a model JT700, 400-hp Omni"- thruster with a 12V6M General Motors diesel coupled to it. The Omnithruster model W700 coupler provides a single lever for thrust direction and diesel speed. This system operated for four years on the 380-foot ice class tanker Imperial Quebec without a single service call. Since that time, there has been only one call for service, which was to replace a loose key in the hydraulic pump. No further service has been required. Western Geophysical Company of America selected a 350-hp model JT700-TD Omnithruster powered by a Caterpillar 3408 diesel for its 186-foot survey vessel Western Shore. This complex, highly instrumented ship was the second dieselpowered Omnithruster installation for Western Geophysical. The diesel Omnithruster package not only provides side thrusting, but also slow-speed propulsion. As the Omnithruster has no hull protrusions and because its intake is guarded by a fine grid it cannot ingest lines or cables. Gulfcoast Transit Company's 42,000-dwt, 655-foot bulk barge Marie Flood is maneuvered with a model PV, 800-hp Omnithruster powered by an MTU diesel. Circle 11 on Reader Service Card PHILADELPHIA GEAR Philadelphia Gear Corporation, King of Prussia, Pa., has a license agreement with Ishikawajima Ship and Chemical Plant Company, Ltd.
(ISC), a subsidiary of IHI, for the manufacture and sale of the IHI Duckpeller 36-degree steering/propulsion system in the U.S. and Canada. The system, consisting of twin drive units complete with propellers, is currently available in five sizes ranging from 2,000 to 5,000 bhp. Features of the system may well revolutionize workboat propulsion in the U.S. Combining thrust steering in a single package, it will lower construction, fuel, and maintenance costs, as well as simplify vessel operation. The Duckpeller, with its unitized design, transmits the power of the main engine to the propeller via two bevel gear sets. The twin propellers, which are fitted in energy-efficient Kort nozzles, can be rotated through 360 degrees, effecting thrust in any direction. This insures high maneuverability in all vessel movements, including on-the-spot turning, sideway movement, and rapid backing without the necessity of a rudder. The unit is furnished with a single-lever, remote-control console incorporating a micro-computer that automatically synchronizes the two propulsion units for movement in the desired direction. The Duckpeller has been used successfully overseas aboard many vessels, including ferries, tugs, towboats, dredges, and floating cranes. Circle 88 on Reader Service Card RACOR Racor Industries of Modesto, Calif., recently introduced a new line of improved filter elements for its fuel filter/water separators. The new Aquabloc™ element gets its unprecedented filtration capability from a new filter medium, designed in a new configuration. The medium, manufactured to Racor's specifications, removes microscopic solids down to two micron. It also repels emulsified water, which coalesces on the surface of the impregnated element paper and runs off. In addition, the paper itself is corrugated, which exposes a larger surface area for filtration. Racor's subtlest innovation comes in the special spacing of the pleats. To prevent the folds from collasping and clogging, the company has found a way of placing a widening spacing-bar at each pleat, thus keeping the folds rigid and holding them apart. Racor products are marketed in 60 countries through a network of more than 2,000 distributors and dealers. Circle 89 on Reader Service Card Renk of Augsburg, West Germany, has available new literature on the Renk Constant Frequency (RCF) gear unit. The publication states that all shipowners ask for more cost-effective onboard power generation than was formerly possible, and one answer is the RCF system, which features a differential epicilic gear and a Renk controller. The epicilic gear unit with hydrostatic or electric superposition enables the generation of economic current by the large diesel engine of the main propulsion plant. The RCF system is said to be a design solution that offers definite economical advantages, especially in plants incorporating low-speed diesel engines and fixed-pitch propellers. However, the RCF system is also used with controlled-pitch propellers and with medium-speed diesel propulsion systems. Installation variants of the RCF system are described, with diagrams, such as parallel, vertical, rectangular, Z-arrangement a shaftmounted generator, U-arrangement as shaft-mounted generator, and special solutions. Circle 90 on Reader Service Card RILEY-BEAIRD Maxim® products manufactured by Riley-Beaird of Shreveport, La., can add to the efficiency of diesel engines by putting normally wasted heat to use. Heat recovery silencers by Maxim reclaim waste heat from the engine's exhaust gases, to generate steam and heat water or other fluids. Maxim silencers, with integral spark arresting, noise control, and energy efficiency, use proven U.S. technology, expertise, and materials. Heat recovery evaporators by Maxim make use of the engine cooling water and/or recovered exhaust heat to provide fresh water from seawater. These evaporators are built to U.S. Coast Guard and American Bureau of Shipping requirements, and are available in a range of sizes to suit engines for main and auxiliary systems, and to satisfy varying shipboard demands for steam and water. They can be supplied as separate, independent, or packaged, integrated systems, for both shipboard and offshore applications. Other Maxim specialty marine products include heat exchangers, seawater strainers, steam-fired boilers, and deaerators. Circle 9 1 on Reader Service Card SCHOTTEL-WERFT Schottel-Werft—Joseph Becker GmbH & Company KG, has been well known for 35 years for its ruuderpropellers, transverse power units, and for the past five years its Schottel-jets. The rudderpropellers were the company's first product, and are supplied as transom and retractable units of up to 6,035 bhp. The next development was the single steerable and non-steerable rudderpropellers that were installed mostly in offshore type vessels. Another development was the Schottel Navigator unit that incudes, mostly on a single frame, the engine with or without the rudderpropeller. It can also be supplied with an integrated steering stand. Next came the steerable and nonsteerable transverse tunnel thrusters and maneuvering units. The latest development, the Schottel-jet unit, is supplied with a horizontal swinging propeller that, with the cone-jet type unit, is running under an angle of 25 degrees. The propeller is thereby accommodated within the bottom line of the vessel. The new Schottel pump-jet does away with the propeller completely, using a rotary wheel instead. These are also 360-degree steerable. Up to 250 hp the units are often controlled by hand; above that power they are steered either hydraulically or electrically. Circle 92 on Reader Service Card SKF STEEL The Coupling Division of SKF Steel, with U.S. headquarters in Avon, Conn., has developed the OKF coupling to fill the need for a simplified method of connecting a shaft to a flanged prime mover or gearbox output. This coupling connects a cylindrical shaft without taper or keyway to the output flange, reducing machining time and costs, and saving installation problems with tapered fits and fitted keyways. The coupling is similar to the OK shaft coupling that uses no bolts, nuts, keys, or keyways. It employs a powerful interference fit to transmit high torque and shock loads—an interference fit that is created without using heat to expand the components. Some of the needs and/or conditions under which the OK coupling is advantageous are: when high torque transmission is essential; high impact loads or reversing torque exist; reduced number of support bearings is desired; and couplings must be balanced exactly. The OK coupling can be as easily removed as mounted; maintenance time for changing seals in bearings, for example, is considerably reduced. Circle 93 on Reader Service Card SULZER The Sulzer Efficiency-Booster is an extremely cost-effective option for Sulzer RTA low-speed diesel engines. Applied as a compact, fully integrated part of the engine, it has demonstrated its ability to contribute further significant fuel savings to what are already highly efficient prime movers. It offers much more than straightforward savings in specific fuel consumption, and opens a whole new area for discussion about engine economy. Its overall benefits include: Reduced fuel costs throughout the engine load range, with fuel savings of up to 4 grams per brake horsepower hour at engine contract maximum continuous rating— equivalent to about 3 percent less fuel consumption. Reduced engine first cost. The added flexibility in engine selection offered by the Efficiency-Booster can allow the use of an RTA engine with fewer cylinders for the same ship requirements, hence a shorter engine room. Greater freedom in ship operation due to the fuel savings at engine part-load. It is thus particularly beneficial for "twospeed" ships—those vessels operating for long periods at reduced speed. Circle 15 on Reader Service Card TECH DEVELOPMENT Tech Development Inc. of Dayton, Ohio, manufactures the TDl Turbostart™ air starter for diesel and gas engines. The company recently issued a new edition of its "Air Starter Selection Guide," a 70- page publication that is a cross reference of engine manufacturers and the appropriate Turbostart model. Included in the guide are specifications for each starter model, and separate listings of diesel and gas engine models by manufacturer. All Turbostart market applications are covered in the new publication. Circle 94 on Reader Service Card THOMPSON-GORDON Thompson-Gordon Limited of Burlington, Ontario, Canada, was founded in 1911, and began manufacturing Thordon® marine bearings in 1970. The Thordon XL alloy represents a unique compromise between the outstanding wear-resisting capabilities of rubber bearings and the high load-support capability of lignum vitae and phenolic. Incorporated into the formulation are low-friction additives that reduce friction in boundary and start-up conditions. The relatively high compression modulus of Thordon permits L/D ratios of 2:1, even for propeller shaft applications. Thordon SXL and XL bearings are also suitable for rudder pintle, stock and carrier bearings, and have been fitted throughout a wide range of vessel types. For exceptionally abrasive operation in rivers or shallow harbors, the company produces a special "Composite" bearing with the capability of offering wear performance con- siderably better than rubber/bronze bearings. The low, dry, dynamic coefficient of friction of Thordon eliminates the squeal or chatter often associated with conventional rubber bearings, and the ease of installation based on the material's machinability and capacity for shrink fittings makes the material an interesting alternative. Thordon bearings are available to suit any size of propeller shaft or rudder. They can be supplied fully finished or in rough form for final machining in the shipyard. There are Thordon stocking distributors in 50 countries; most have technical specialists available to provide field support. Circle 9 5 on Reader Service Card TWIN DISC Twin Disc, Incorporated of Racine, Wise., has been a leading manufacturer of heavy-duty power transmission systems for more than 60 years, and has long been recognized as a standard of comparison in the marine industry. In addition to 22 models of Twin Disc-manufactured marine transmissions covering a broad power range from 70 to 1,600 bhp, the Wisconsin company offers many other marine products backed by Twin Disc. These include: Twin Disc/ NICO marine transmissions with power ratings up to 5,000 bhp; Twin disc/Scanprop controllable-pitch propeller systems; a complete line of marine transmission accessories; and approved renewal parts and parts kits. Several significant equipment options insure that a Twin Disc marine transmission can be tailored to a particular vessel's operation. These include front—and pump-mounted power takeoffs, top power takeoffs, live power takeoffs, trolling valves, output coupling flanges, heat exchangers, and indicating gauges. Most Twin Disc marine transmissions have been approved by the American Bureau of Shipping, Lloyd's Register of Shipping, Det norske Veritas, and Bureau Veritas. Circle 9 6 on Reader Service Card UNIPAR UNIPAR, Inc., a division of National Marine Service, Inc., has available literature that highlights the 40,000-square-foot facility the company has in St. Louis to provide diesel engine power packs, parts, and components. Monorails and accumulating conveyors in the semi-automated facility play major roles in the company's commitment to quick service and quality products at competitive prices. The brochure contains photographs of the semi-automated line of work stations, and discusses each process along the way through the final work station. Circle 12 on Reader Service Card WABCO WACO Fluid Power of Lexington, Ky., an American-Standard company, pioneered the concept of remote pneumatic maneuvering control of marine propulsion engines in the early 1940s, and today is a leading U.S. and international supplier of wheelhouse controls for a wide variety of diesel-powered ships. With control placed directly at the pilot's command, maneuverability is greatly increased and more efficient vessel operation is obtained. As the operator is now removed from direct contact with the propulsion machinery and cannot devote his complete attention to precise manipulation and timing of the control handle movement, the possibility exists for mishandling the propulsion machin- ery unless a properly engineered control system is installed. WABCO control systems are designed on the concept of single handle control of all maneuvering operations through a sequenced and interlocked control system, which insures that the proper operation of engines, clutches, reverse gears, and associated propulsion machinery is obtained without relying on operator judgment to time or anticipate propulsion machinery functions. The flexibility and adaptability of pneumatic controls permits the installation of multiple operating stations with interlocked control transfer to insure that only one station can be in control at anytime. Rugged control components provide dependable operation under extreme operating conditions experienced in shipboard installations. The relatively uncomplicated component and control system construction facilitates maintenance and serviceability, contributing to extended system life and low maintenance costs. Production control systems such as Gearmaster, Logicmaster Hydraulic Clutch, and Logicmaster Air Clutch are available for standard engine reverse gear applications. They combine proven, high-performance WABCO Pneumatic components in factory-assembled, tested, and pre-adjusted control units to simplify shipboard installation. All components are sub-base mounted, where possible, for easy and convenient servicing. These systems are generally applicable for installation up to 4,000 bhp per engine. Recent control techniques combine the advantages of electronics and pneumatics to provide highspeed, electronic signal transmission from very distant remote stations, converted to pneumatic power at the engine location to perform the normal interlocking, sequencing, and positioning operations required. WABCO's Helmmaster control systems combine the normally separate control levers for main engine/ propellers, bow and stern thrusters, and rudders into a single joystick control lever that can precisely control vessel maneuvering. Circle 97 on Reader Service Card WARD LEONARD Ward Leonard Electric Company of Mount Vernon, N.Y., offers a full complement of quality electric controls and other shipboard equipment for both defense- and maritime- oriented applications. Included are state-of-the-art solidstate motor starters, battery chargers, and uninterrupted power supplies, which may be used with equipment that turns a diesel engine into a complete marine propulsion system. These modern designs offer high efficiency, smaller and lighter enclosures, and lower costs. Ward Leonard also is the prime designer of a new system for the remote control of motors using fiber optics. Over the years, the company has furnished much equipment for numerous naval and commercial vessels. Ward Leonard's manufacturing facilities are extensive, utilizing the latest techniques and quality control procedures. Its design and production force is experienced and knowledgeable, permitting quick and efficient response to customer requirements. Circle 98 on Reader Service Card WESTERN GEAR The Power Transmission Division of Western Gear Corporation recently entered into a license agreement with Rademakers Aandrijvingen of Rotterdam giving the Division the right to manufacture and sell the Dutch company's epicylic planetary transmissions in all of North America. This particular Rademakers product line is based on the Stoeckicht design, which provides for a compact co-axial shaft transmission with low noise levels, high efficiencies, and high reliability. Applications for these transmissions include speed increases and decrease s for turbine generators, pumps, and compressors, and various marine propulsion reduction gears. The Power Transmission Division manufactures an extensive line of power transmission equipment in- eluding: marine propulsion gears for military and commercial vessels; industrial gear drives used in the production, transportation, and procession of petroleum, natural gas, and chemicals; drives used in the generation of electrical power; and gears used for refrigeration and air conditioning applications. Circle 14 on Reader Service Card WRIGHT-AUSTIN Wright-Austin Company of Detroit, supplier to the Navy and merchant marine for more than 55 years, manufactures entrainment separators for removing condensate from any on-board air or steam systems. All of the company's separators meet or exceed all requirements of the U.S. Navy, the U.S. Coast Guard, and the American Bureau of Shipping. 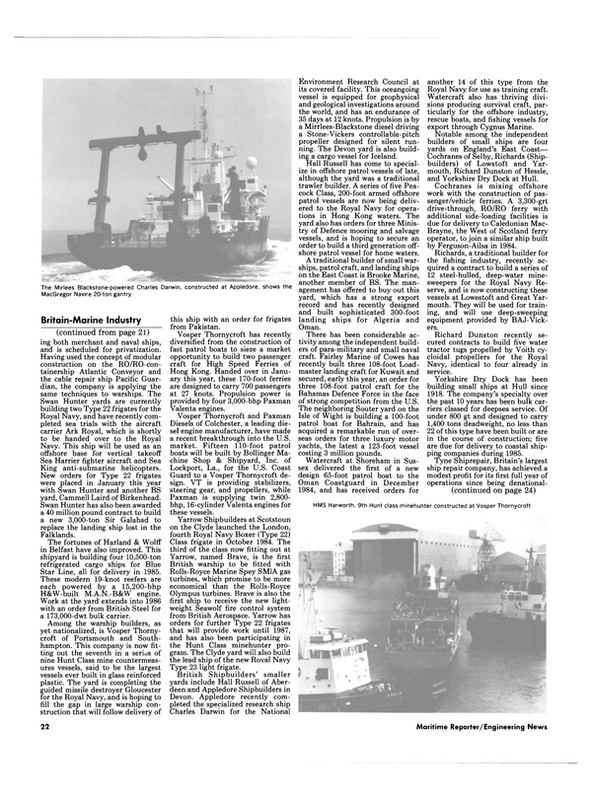 Military ships currently using Wright-Austin separators include the Navy's nuclear aircraft carriers, guided-missile cruisers, destroyers, and rescue/salvage vessels, as well as the Coast Guard's medium- endurance cutters. Circle 99 on Reader Service Card ZURN The Mechanical Drives Division of Zurn Industries, Inc., Erie, Pa., has just published a new eight-page catalog covering its seven product lines. The new brochure provides highlight information including features and application data, as well as size, torque, and misalignment ranges of the Zurn mechanical drives product lines. The catalog is designed to make this basic information readily available to design, application, maintenance, and production engineers and other prospects for necessary product decisions. The customer is then directed to the appropriate indepth catalog for complete detailed information. Zurn has six detailed catalogs available totaling 146 pages of data. The separate catalogs are: Amerigear ® and American® standard coupling designs; Amergear Class I high-performance gear couplings; Ameriflex® high-performance diaphragm couplings; Amerigear flexible spindles; Zurn/Voith universal joints; and Zurn TORC torque overload release clutches. All of these products are outlined in the new condensed bulletin, which includes a postcard order form to expedite delivery of the appropriate detailed catalog(s).